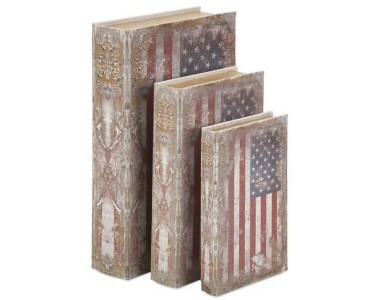 American Flag Book Boxes - Set of 3. American Flag artwork adorns this trio of book boxes in varying sizes. Boxes measure 1.25-2-3"h x 5.75-6.75-8.75"w x 8.50-10.25-13". There may be slight variations in finish, color and texture due to the handmade nature of the item. Care instructions: Dust with a clean dry cloth. From IMAX- One source, a world of choices. Boxes measure 1.25-2-3"h x 5.75-6.75-8.75"w x 8.50-10.25-13"
IMAX Worldwide-One Source, A World of Choices!